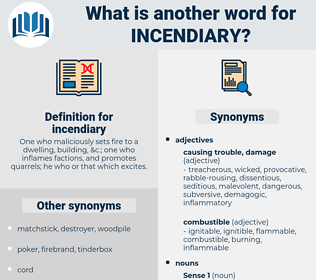 What is another word for incendiary? One who maliciously sets fire to a dwelling, building, & c.; one who inflames factions, and promotes quarrels; he who or that which excites. 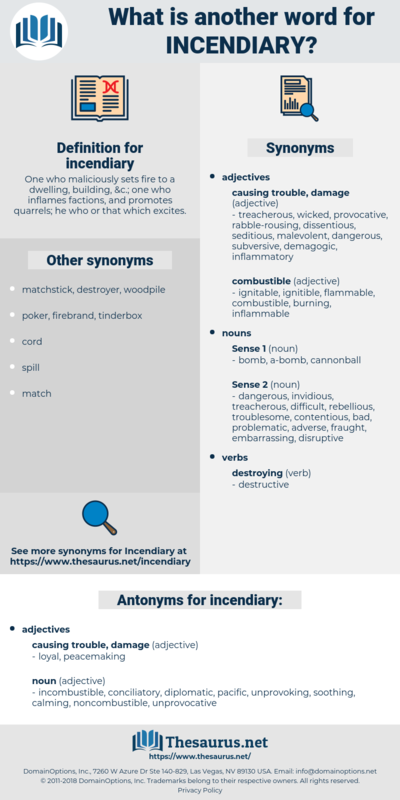 incombustible, conciliatory, diplomatic, pacific, unprovoking, soothing, calming, noncombustible, unprovocative. But if they stand on board a ship and, mad with rage, and, without interruption and unremittingly, throw incendiary matter at each other you would rather stop them before the ship is in flames. Not until he had pulled the charred sticks from beneath the end of the barn, and assured himself every spark had been drowned out, did Joe speak, and then it was to relieve his mind by making threats against the would - be incendiary.